If Dr. Seuss were to illustrate a motor scooter, it might get skinnier and taller, and the wheels might get smaller, and it would probably look a lot like this OJO. I bought the black one, from Best Buy who were selling these for a while. I think they no longer do so. I was considering one, along with various other categories and models of electric scooter. However I had already decided to rule out the faster road-going models that require licensing and insurance and can only be ridden out on the roadway with the cars. I also ruled out the very small folding type, because tiny wheels are not really very safe, or comfortable, at higher speeds, and most of these things can go 15 to 20 MPH. The OJO tire diameter is just 11 inches. Regular readers of the-vu will know that I have written several times in the past that 12 inch tires are the minimum size for safety on a scooter, but that was regarding bicycle type wheels and tires, and no suspension whatsoever. The Ojo tires are 11 inch motorcycle tires and there is reasonable front and rear suspension, so 11 inches, while small, is safe at the intended speed. 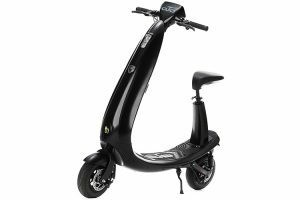 In fact there are several other safe, and considerably faster scooters now that only have 10 inch tires, but they have amazing suspension so it makes it okay. This scooter can be ridden sitting or standing. 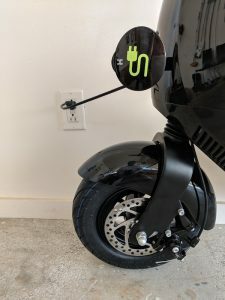 If you are sure you prefer to stand, you can remove the seat and post assembly and install the bundled cover plate, so you have a full time standing scooter with a little more foot room. 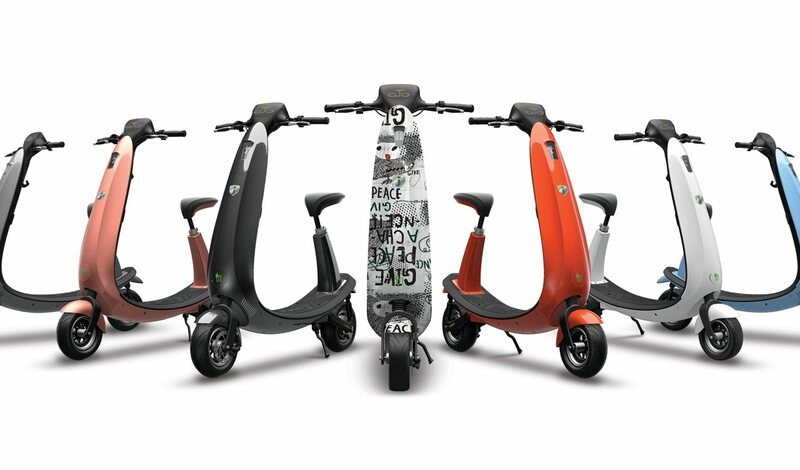 According to all technical reviews so far, the quality is above and beyond that typical for electric scooters. The bluetooth enabled LCD display unit has a touch screen, there are LED headlights and tail lights, there is a brake light, and there are three speed modes, with the fastest taking you up to 20 MPH. Unusually there is a built-in amplifier and speakers so you can transmit music or other sounds via Bluetooth from your phone through the scooter speakers. The charger is onboard, so you just have to reel out the cord and plug into any normal power outlet, either at home, or along the way. The main feature is the touch screen, clearly visible in any light, and an easy interface for everything. Well worth cutting a hole in the finger of a glove, if you ride in a chilly climate. Remote keyfobs unlock, lock, and arm and disarm a very loud motion alarm. While a thief could wheel it away, they would never be able to turn it on to use it, and it would be making a huge noise. It does not fold, but can slip easily into a compact utility vehicle or similar. It’s intended use is in the bike lane, (where present), or to the side of the roadway, just like a pedal bicycle. Also, just like a bike, no license or insurance are required. This makes it much simpler to own than a faster moped, electric or otherwise. The current model should have a range of 25 miles on a full charge, and there may be a new one coming soon that will go 50 miles (to be confirmed). All of the above was written before the receipt of my OJO, so let’s press on with my review. More technical and detailed info can be found via YouTube reviewers, but I will describe how my OJO works for me, personally. So the Geek Squad van from Best Buy arrived as scheduled and a man took the giant carton into my garage on a dolly. Just as in the excellent YouTube video by Blue Monkey Bicycles, unpacking was simple, and the OJO was ready to ride without any adjustment whatsoever. I did follow the manual’s advice and fully charge it first, but I could have jumped straight on. Instead I screwed in the included rear-view mirrors and settled in for the wait. The aforementioned Blue Monkey Bicycles also have good YouTube videos on using the touch screen, removing or re-installing the seat and exploring the maximum range. With so many technical reviews and videos available I will stick with my own subjective experience for this article. 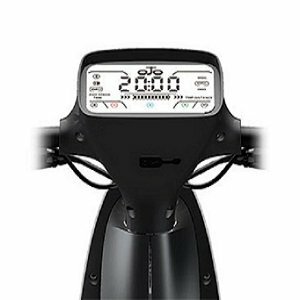 The general quality of this scooter is beyond anything we expect from electric bikes, other e-scoots, and also the majority of Asian mopeds and motor scooters. Every detail is very good. The key fob is your key to arming and disarming the motion alarm, and turning the OJO on and off, which she confirms with a pleasant voice. Since the OJO is “bike lane friendly”, the left lever is the front brake and the right is the rear, as on any bicycle or kick scooter, and so the front brake is not where you would expect it to be on any motorcycle. The “throttle” (more correctly a potentiometer on an electric vehicle) is a lever under the right thumb. It behaves more like an on/off switch than a gradual speed control, so it is good that there are three speed modes. So, you just switch it on, sit or stand, and go. It can take a mile or so to get used to a new scooter. In my case, I am accustomed to standing on a wide variety, but found the sitting experience to be quite alien. Again, dedicated standing surfers can replace the seat assembly with the cover plate if they want. Of course you have to decide how to set the mirrors, for standing, or for sitting. It is easier to twist and look behind when standing. The suspension made the 11 inch tires feel much bigger. Of course deep potholes would have to be avoided. One negative that struck me immediately was how loud this scooter is. I have had much quieter electric rides in the past. This motor howls a bit, and there is some sound inducing vibration in the cowl area, to be hunted down at a future time. (Update: It comes from the front mudguard) I am aware though, that such motors may howl less loudly as they “wear in”. Eco (aka Easy) speed is for maneuvering through, and sharing the space with, pedestrians or slow bikes. It feels slow, but is actually about as fast as I can propel a bicycle for long periods. It is ideal for safely riding on the sidewalk when too much traffic is squeezed into the street. Next higher mode is Touring (aka Economy), which seems to average out around 16-17 MPH. This is fast enough, but there is also the third level, Sport, which pushes you to around 20 MPH. Not a large difference between Touring and Sport modes. Changing speed modes on the fly requires care as you need to move one hand from the grips to the touch screen. It will take me some time to feel familiar enough to do very tight turns without worrying about instability, but on the road, the ride is smooth and feels very stable. I doubt I will ever use this amp and speaker system for music, but I am thinking about some unusual sound effects that could make the ride more, funny. Perhaps mad jungle animal sounds. On my second day I found that my impressions were changing. I was getting used to the motor sound and had to remind myself that nothing is as silent as a larger hub motor. I found I was warming up to the seat, and I intend to leave it on. I feel safer in a standing position when starting, and when making turns. The whole-body, surfing, skatingboarding, control reflexes, with the feet in the surfing/archery position, provides a more confident balance. But I am enjoying taking a seat on the straightaways. I have settled on adjusting the left mirror for standing and the right for sitting. I tried a brief foray onto the grass and despite the OJO’s smooth suspension on roads, I would suggest that it be kept on the pavement at all times. This is not for dirt trails, grass, or anything else that you wouldn’t skate on. I will simply assume that the 25 mile range estimate is honest. I have no plans to personally test that to it’s limit. Again another reviewer has confirmed it on his own OJO. For me, having the charger built in, and not a separate brick and cables that you have to store and manage, is one of the best features. So overall I am pleased and impressed, especially with the overall quality. 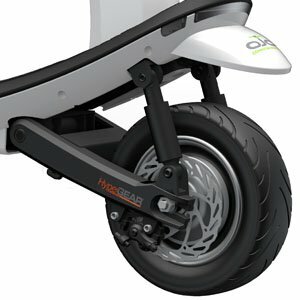 Is this a gateway drug to a road-going electric motor scooter such as the new Vespa Elettrica? Hopefully not. At the retail price of $2,000, the OJO is a class leader, albeit a small class with nothing particularly similar out there. It took me a long time to get around to this, but I have removed the seat. I always ride standing up, finding that my legs provide extra suspension, control and comfort, and I was only using the seat to have quick sit down at traffic lights and stop signs. OJO owners note, there is an additional clamp under the floor, not mentioned in the manual, that needs to be opened to allow the seat post to come out. After nine-months of occasional use, the OJO is as good as new, and I really enjoy it. Most of my rides are short, under 15 minutes each way. It is perfect for this. Jeffrey the Barak has so far owned at least sixteen kick scooters and four electric scooters.